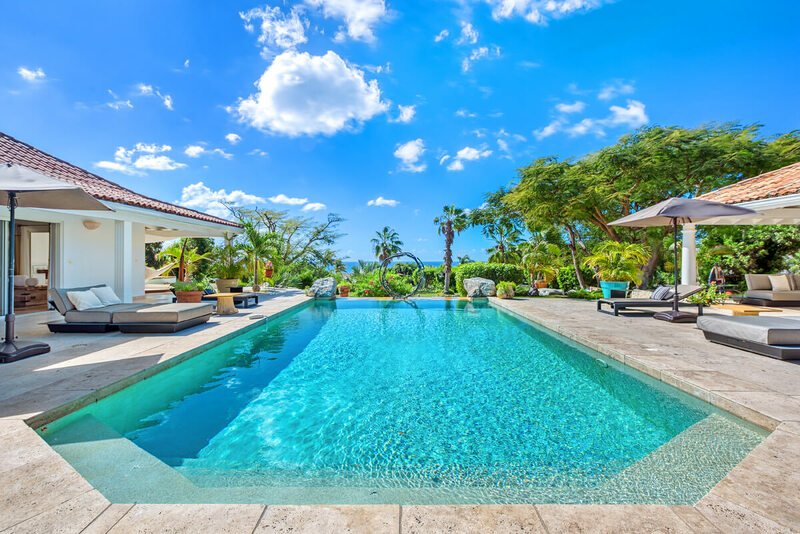 If you have a large family or party traveling together, La Pinta has a sister villa—La Nina—right next door that can be rented in tandem with La Pinta to double your living space and amenities. The large gym gives visitors a place to get their endorphins stirring, and then you can cool down on the large outdoor bed or in the pool. You’re only five minutes from a wide array of restaurants offering the best in local cuisine and only 3 minutes from the closest beach. The well–equipped barbeque offers the perfect solution to the age old question of, “what’s for dinner?” You can cook some fresh fish, open a bottle of wine, and dine on the terrace while the sun sets over the water. The open design of this four-bedroom villa is in complete harmony with its natural setting. The view from the living room stretches from the tastefully furnished deck to the distant horizon giving the impression of even more space. A covered porch with outdoor dining and lounge areas gives La Pinta an authentic Creole flavor. All 4 bedrooms have king-size beds; all feature private bathrooms with showers, air-conditioning, and ceiling fans. La Pinta also features sunset views, gardens, a tennis court, and a gym room. Need more bedrooms? ... La Nina, which shares the lot can provide two more bedrooms to accommodate an extended family. We do not guarantee the internet connection. The owners or Wheretostay.com cannot be held responsible if it is not working properly. In case the wireless connection is not working, a dial-up connection for $95 and 50 hours connection can be provided. La Pinta is now equipped with a mosquito repellent system around the house. The system uses only all-natural, essential oils. Three minutes drive to the closest beach. We were pleased to stay in La Pinta. It was very pleasant, interestingly decorated, and has a remarkable pool area. La Pinta is one of the best villa in Terres Basses! The villa staff was very polite and attentive to all our questions, and quickly resolved all our problems. Thanks for all staff of the villa. Special thanks to Shawna, as she did not leave us without attention.